London-based band Yuck return to Liverpool with their new sophomore album ‘Glow and Behold’, and a new lineup behind it. With the departure of singer/co-songwriter Daniel Blumberg and arrival of new guitarist Ed Hayes, guitarist Max Bloom has stepped up to the mark as lead singer both on and off the record – and the product of this is simply outstanding. A couple of words to say before we get into the nitty-gritty details – this show was packed. What surprised me days, even weeks before the show was the fact that Yuck were playing The Shipping Forecast – possibly the most intimate venue in the city. 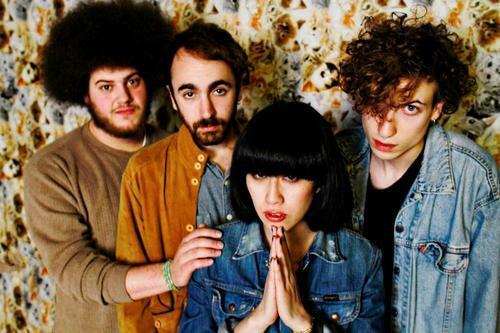 Yuck have achieved a lot since their debut ‘Yuck’ (2011), and having just come off a tour with The Pixies the question is raised of why they’re playing such small shows – having a headline slot at London’s Shepherd Bush Empire next February only adds to this. Nonetheless, this tour offers a fantastic opportunity for people to get close to the band; Bloom friendly stating during the show “I can actually have a proper conversation with you”. The setlist for the show was genuinely fantastic, encompassing material from both albums, as well as a cover of New Order’s ‘Age of Consent’. What pleasantly surprised me was how the band adapted to the departure of previous singer Blumberg, using all of the elements of each band member to slightly shake up the older material. The band evidently, however, aren’t dwelling on the past, launching into single ‘Middle Sea’ from the new album. Shoegazey “nineties-revival” guitar makes a powerful start to the show, and provides a solid platform for what it would become. A show favourite for me was ‘The Wall’ from the debut album, bassist Mariko Doi taking a lead vocal-wise, as well as changing the key. In my honest opinion, I think that using the hidden musical strengths not present on the last album has improved the band’s musicianship in an indescribable way, making the live show all the more enjoyable. The band were well praised for returning to the stage after closing with ‘Operation’ for an encore featuring ‘Memorial Fields’ and crowd favourite ‘Georgia’, a song with one of those forget-me-not chord progressions and general Summer ambience that is needed on a cold, northern November evening. The setlist proved an absolute treat, and this is a show I’m not going to forget! Yuck are currently on tour throughout the UK, ending on 20th November at the Norwich Arts Centre. They head off on a US tour throughout January and February before returning to the UK to play London’s Shepherd’s Bush Empire on 19th February. Their new album ‘Glow and Behold’ was released on 30th September.